Turkish and Ottoman Style Calligraphy ( Hat ) Lessons in Istanbul. Ottoman - Turkish Calligraphy, also known as Arabic calligraphy, is the art of writing, and by extension, of bookmaking. This art has most often employed the Arabic script, throughout many languages. Calligraphy is especially revered among Islamic arts since it was the primary means for the preservation of the Qur'an. Ottoman Turkish calligraphy is associated with geometric Islamic art on the walls and ceilings of mosques as well as on the page. 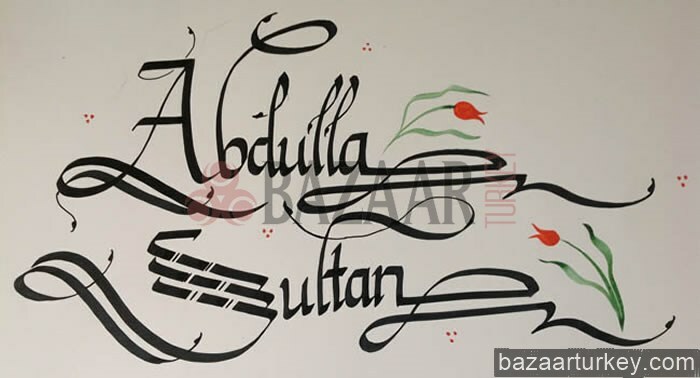 Contemporary artists in the Islamic world draw on the heritage of calligraphy to use calligraphic inscriptions or abstractions in their work. The first of those to gain popularity was known as the Kufic script, which was angular, made of square and short horizontal strokes, long verticals, and bold, compact circles. The Diwani script is a cursive style of Arabic calligraphy developed during the reign of the early Ottomans (16th and early 17th centuries). It was invented by Housam Roumi and reached its height of popularity under Süleyman I the Magnificent. As decorative as it was communicative, Diwani was distinguished by the complexity of the line within the letter and the close juxtaposition of the letters within the word. In the teachings of calligraphy figurative imagery is used to help visualize the shape of letters to trace. The traditional instrument of the Turkish - Ottoman calligrapher is the kalem, a pen made of dried reed or bamboo; the ink is often in color, and chosen such that its intensity can vary greatly, so that the greater strokes of the compositions can be very dynamic in their effect. in our workshop located in Sultanahmet / istanbul. ** If you have any interest of learning Classical Ottoman Calligraphy, joining a workshop or ordering a special Turkish Calligraphy Work from our teachers Mr. Eftel, Mr. Melih, Mr. Tolga can show you the basic and advanced techniques of it. Please call us or send us an e-mail to get more information and to get a meeting..
Our Traditional Calligraphy Set is Available for Purchase in Our Gallery. We can also mail it all over the world. The literal meaning of the Turkish word for calligraphy (hat) is line or way. In essence, Husn-i Hat comprises the beautiful lines inscribed with reed pens on paper using ink made from soot. In the 13th century, Yakut-ul-Mustasimi,a calligraphist from Amasya, made a breakthrough in calligraphy by using nibs of various widths and sizes in one composition. Later calligraphists followed and developed his methods. Later, Sheyh Hamdullah, a famous calligraphist from the period of Sultan Mehmet the Conqueror, introduced major changes in the traditional seven writing styles and put the mark of the Turkish national character on Islamic writing. His followers further improved Turkish calligraphy over the centuries. Hafiz Osman, Mustafa Rakim, Yesari Mehmet, Sevki Efendi, Sefik Bey, Mahmut Celaleddin, Kadiasker Mustafa Izzet, Sultan Mahmut II, Aziz Efendi, Necmettin Efendi, Sami Efendi and Hamid Aytac are all noted Turkish calligraphists who contributed to the development of this art. 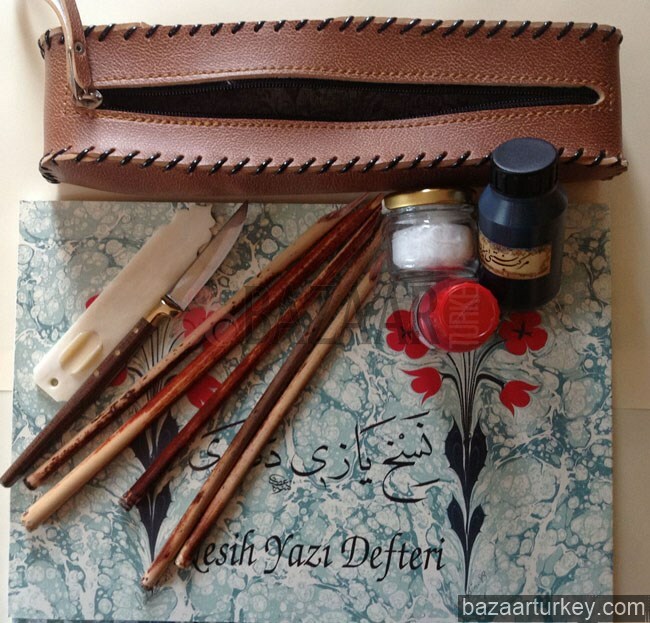 Turkish calligraphists have always made the paper, pens and ink they used. The paper used to be painted with natural dyes. Then it was polished with boiled starch and egg white. The paper dressed in this way allowed for easily correcting mistakes. Pens were made of hard reeds. Bigger pens (known as "celi") were made of wood. To produce ink, the calligraphists used to burn materials such as pine and linseed oils. Islamic Mosque calligraphy is calligraphy that can be found in and out of a mosque, typically in combination with Arabesque motifs. Arabesque is a form of Islamic art known for its repetitive geometric forms creating beautiful decorations. These geometric shapes often include Arabic calligraphy written on walls and ceilings inside and outside of mosques. The subject of these writings can be derived from different sources in Islam. It can be derived from the written words of the Qur'an or from the oral traditions relating to the words and deeds of Islamic Prophet Muhammad. There is a beautiful harmony between the inscriptions and the functions of the mosque. Specific surahs (chapters) or ayats (verses) from Koran are inscribed in accordance with functions of specific architectural elements. For example, on the domes you can find the Nour ayat (the divine stress on light) written, above the main entrance you find verses related to the entrances of the paradise, on the windows the divine names of Allah are inscribed so that reflection of the sun rays through those windows remind the believer that Allah manifests Himself upon the universe in all high qualities. When we speak of Turkish calligraphy, we refer to writing of aesthetic value in characters based on the Arabic script, which the Turks had adopted as their writing medium after their conversion to Islam. The Arabic characters gradually assumed an aesthetic function after the advent of Islam, and this process gathered momentum from the mid-eighth century onwards, so that calligraphy was already a significant art discipline by the time the Turks joined the Islamic world. Therefore it is necessary to begin with a brief review of the structure of Arabic characters and their development during the early centuries of Islam. The most succinct definition of calligraphy formulated by Islamic writers is, "Calligraphy is a spiritual geometry produced with material tools." The aesthetic values implied by this definition held true for centuries. visual impact attained when they were joined together, and above all the fact that the same word or phrase could be written in various ways opened the door to the infinite variety and innovation which is a prerequisite of art. Just as the characters could be written singly in several different ways, so there was an astonishing diversity of different scripts or "hands". The Arabic characters were adopted — primarily motivated by religious fervour by virtually all the peoples who converted to Islam, so that just a few centuries after the Hegira they had become the shared property of the entire Muslim world. The term "Arabic calligraphy", which is appropriate with respect to the early period, broadened in scope over time to become what more accurately might be described as "Islamic calligraphy". This writing system, known as nabatî because it was used by the Nabat tribe in pre-Islamic times, derives from the Phoenician. In its early form, the script gave no clue of its future potential as such a powerfully aesthetic medium, the characters consisting of very simple shapes. With the emergence of Islam, however, and particularly after the Hegira, the Arabic script became the literary vehicle of the last Semitic religion. The numbers of those literate in the Arabic script multiplied rapidly, and in time it was perfected into a vehicle equipped to record the Koran, and hence the language as a whole, with precision. Vowel signs known as hareke were invented to express the short phonemes which accompanied the consonants. The method of determining the sound of letters which resembled one another in form, by means of disparate positioning and diacritical marks was developed. As time passed, the use of diacritics to distinguish the undotted from the dotted forms of the same letters was introduced. Both the diacritics, the vowel signs and the unmarked letter symbols took on decorative forms which played a major role in the development of writing as an art. Meanwhile, the frequently used definite article, consisting of the letters alif and lâm, became a balancing element in the aesthetics of calligraphy. Name Writing by Our Artist our artists in Latin Letters..
At different periods, depending on the centre of calligraphy at the time, the Arabic script was known variously as anbarî, hîrî and mekkî in pre-Islamic times, and after the Hegira these were qualified by the term medenî. The Koran, which was the first Islamic text compiled in book form, was first written in mekkî-medenî hand in black ink on parchment, without diacritics or vowel signs. Not surprisingly, artistic considerations were not a concern for the early Koran copyists. In time this style of writing divided into two forms; the sharply angled form being reserved for Korans and important correspondence. Since this was most often used in the city of Kûfa, it became known as kûfî. The other form, which did not have sharp angles and could be written at far greater speeds, was employed in day-to-day uses, and due to its rounded, flexible character was suited to artistic application. Under the Umayyads, the spread and evolution of this script in Damascus was rapid. It was this form which began to give rise to new scripts after the development of pens with nibs of different widths in the eighth century. Among the earliest of these were the celîl reserved for large scale lettering, and tomar or tûmar which was the standard large size pen used in official correspondence. Pens with a nib width two thirds of that of the tomar pen were known as sülüseyn, and those with nibs one third in width were known as sülüs. These were to give their names to the scripts which were written with them. Other new writing styles which emerged (although all later fell into disuse) were riyasî, kalemü'n-nisf, hafîfü'n-nisf and hafîfü's-sülüs. As their names indicate, some of the new scripts were based on tomar and written with pens which were specific fractions (half, one third, or two thirds) of the tomar pen. In the process of scaling down, the scripts took on new characteristics of their own, while the word kalem, which referred to the writing instrument, also came to be used for the writing itself (for example, kalemü'n-nisf literally means "half pen"). For scripts such as kisas and muâmerat, which were invented for specific uses and did not involve the proportional scaling down of the pen, the term hat was used. Under the Abbasids, learning and the arts flourished, leading to a swelling demand for books in Baghdad and other major cities. To meet this demand the number of copyists known as verrak also rose, and the script which they employed in the copying of manuscripts was known as verrâkî, muhakkak or irâkî. From the end of the eighth century, as a result of the search for aesthetic values by calligraphers, writing forms according to specific proportions and symmetries became known as aslî hat and mevzûn hat. One of the calligraphers who contributed to the development of writing, and the most outstanding among those of this period was Ibn Mukle (? -328/940), who drew up rules for calligraphic composition. Lettering complying with these rules was called mensûh hatti, a term meaning "proportional writing". the Maghrib, where it became known as magribî. In Persia and further east, meanwhile, kûfî was transformed into a script known as mesrik kûfîsi, which was used until superseded by the aklâm-i sitte scripts. The large scale form of kûfî known as iri kûfî, which was mainly used on monuments, was reserved for decorative purposes in combination with some elements of embellishment. The form of mensûb hatti known as verrâkî mentioned above, which was generally reserved for copying books and therefore known as neshî (a derivation of the verb istinsah, "to copy"), was the prototype for the muhakkak, reyhânî and nesih scripts which emerged in the early eleventh century. The most outstanding calligrapher of this period, Ibnü'l-Bevvâb (? -413/1022) introduced changes to the rules set by Ibn Mukle and the style he initiated was widely used until the mid-thirteenth century. The calligrapher Ibnü'l-Hâzin (? -518/1124) contributed to the evolution of the tevkî' and rika' scripts, and finally Yâkûtü'l-Musta'simî (? -698/1298) who developed the rules set by Ibnü'l-Bevvâb and wrote the finest thirteenth century forms of sülüs, nesih, muhakkak, reyhânî, tevkî' and rika' appeared in Baghdad. The above six scripts are known as aklâm-i sitte ("the six hands"). The idea of cutting the nib of the reed pen at an angle instead of horizontally was his, and an innovation which contributed enormous elegance to writing. Once "the six hands" had taken their place in the art of calligraphy together with all their rules, many scripts apart from those mentioned above were abandoned, and no trace of them but their names remains today (for example, sicillât, dîbâc, zenbûr, mufattah, harem, lûlûî, muallâk and mürsel). Following the death of Yâkût his conception of "the six hands" was carried by scribes who had trained under him from Baghdad to Anatolia, Egypt, Syria, Persia and Transoxania. New generations of calligraphers who trained in these lands dedicated themselves to the path taken by Yâkût as far as their aptitude permitted. However, as time passed changes crept in. In the hands of the Ottoman Turks, these six scripts were poised to begin the ascent to their zenith.